If you've entered a lot of supplementary information for your terms, you can display that information in the sidebar. This can help writers use the term correctly without having to open the full term help. For example, you could add a note on how to use the term correctly. Always edit your overlay copy in the configuration directory rather than the installed version of the file. You can use the following sample code to get started. 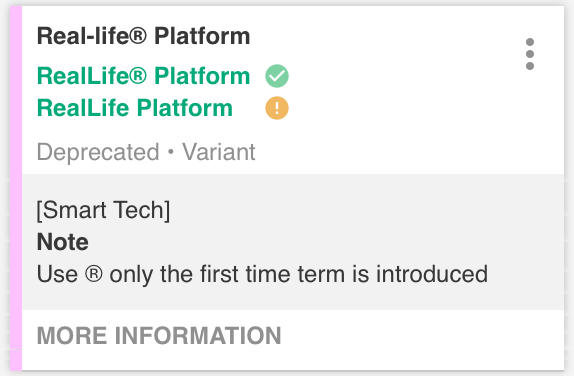 This configuration will display the status, domains, definition, and note for each term that shows up as a terminology issue. Edit the code and add any other desired variables. Replace <FIELD_NAME> with the name of the required field — like this: $customFields.usage_guide . If needed, surround the variable with any extra HTML formatting like line breaks or bold tags. For more detailed information on variables for term help, see the section About Term Help Template Variables in the article Configuring Term Help Templates. The variables that you use for the term help file are the same variables that you can use for the term help in the sidebar. You'll see your changes the next time you run a check.